Republicans are leaving the U.S. House at the highest rate in a decade. As of Tuesday, 24 GOP representatives have already announced that they will not run for re-election in 2018. Of these, 13 are “pure retirements” — those who are leaving politics for good and not running for higher office.1 Bolstered by high-profile rage-quits in the Senate, a narrative has emerged that Republicans are bolting out of frustration with Trump-era dysfunction or fear of getting washed away in a building Democratic wave. They’re not owning up to that, of course. Among the statements issued by the 13 Republicans who announced their pure retirements, only three2 cited the political environment as a factor in their decisions. Three others explicitly denied that the environment was a factor.3 Eight Republicans, including one who also cited the political environment, trotted out the old cliche of spending more time with their families. Of course, that line is used as an excuse as often as it’s true — so we put the members’ statements to the statistical test. What do these 13 Republicans have in common? And which GOP representatives might follow them out the door? To measure whether Republicans were leaving out of frustration with President Trump, we compared the 13 pure retirees’ Trump scores (FiveThirtyEight’s measure of how often each member of Congress votes with the president) with those of the other 227 House Republicans. To measure whether they were leaving out of fear of losing re-election, we compared the partisan lean (the average difference between how a district voted in the last two presidential elections and how the country voted overall4) of their 13 congressional districts to the 227 other districts represented by Republicans. And to measure whether they were fed up with extreme polarization, we assessed how far right they fell on the primary dimension of DW-Nominate compared to their 227 caucus-mates. DW-Nominate pinpoints politicians on the traditional left-to-right spectrum, assigning them a grade from 1 (most conservative) to -1 (most liberal) based on their congressional voting records. DW-Nominate scores vary from 1 (most conservative) to -1 (most liberal). A district’s partisan lean is the average difference between how the district voted and how the country voted overall in the past two presidential elections, with 2016 weighted 75 percent and 2012 weighted 25 percent. In the aggregate, the 13 pure retirements are indeed more anti-Trump, more moderate and more electorally vulnerable than the rest of the Republican caucus. The differences are small but meaningful, especially the 9.2 percentage point difference in district lean and the retirees’ lower-than-average 89.9 percent Trump score.5 But there remains plenty of variation from member to member. For every Ileana Ros-Lehtinen (72.9 percent Trump score, 0.245 DW-Nominate score and a district that leans 13.9 points more Democratic than the country as a whole), there’s a Dave Trott (98.0 percent Trump score), a Jeb Hensarling (0.704 DW-Nominate score) or a John J. Duncan Jr. (his district is 38.2 points more Republican than average). The overall pattern suggests that the political climate is driving many of these members’ decisions to retire, but the exceptions indicate that this motivation probably isn’t universal. So we took another look at what else these 13 members had in common, and two things stood out. First, at least seven6 of the 13 pure retirees belong to the Tuesday Group, a caucus of moderate Republican representatives who style themselves as the “governing wing of the party.” This septet (88.2 percent Trump score, 0.314 DW-Nominate score, 5.6-point Republican lean, on average) appears to be the core of the group that is retiring for political reasons. Here’s the kicker: The two groups barely overlap. 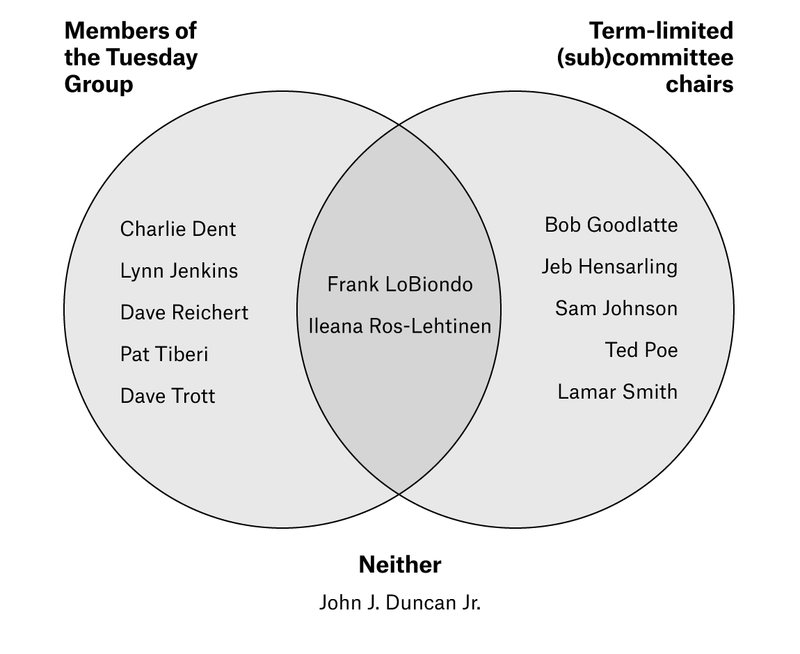 Most of the retiring Republicans who aren’t in the Tuesday Group are term-limited (sub)committee chairs, and vice versa. Only one retiree, Duncan, doesn’t fit into one of these two categories, and he is probably leaving for the simplest reason of all: actual retirement. (He has served in Congress since 1988.) In other words, there appear to be two main reasons that Republicans are retiring from Congress in 2018: The political environment and the loss of leadership roles. Armed with this knowledge, we can take a stab at figuring out who the next Republican retirements might be. The table below contains a non-exhaustive list of Republican representatives who have not yet confirmed they are running for re-election and who could potentially jump ship based on our criteria — in other words, moderates, people in vulnerable districts or people who would have to give up leadership roles in 2019. The table also lists another critical metric for guessing who’s about to retire: funds raised. Members tend not to raise very much dough for re-election campaigns they don’t intend to undertake. Who might be next to retire? Maybe the likeliest retirement prospect is New York’s Peter King, who is both a Tuesday Group member and the term-limited chair of the Homeland Security Subcommittee on Counterterrorism and Intelligence. He’s also raised a pitiful $294,848 and has one of the lowest Trump scores in the Republican caucus. Michael Turner of Ohio is another decent bet — he’s the only other member to check both the Tuesday Group and chairmanship boxes. Thomas Rooney’s low fundraising totals would seem to confirm rumors that he’s looking to run for statewide office back home in Florida. Dan Donovan’s fundraising totals raise questions about whether he intends to suit up for what looks like a nasty primary with former Rep. Michael Grimm. Democrats would be particularly gleeful if term-limited subcommittee chair Dana Rohrabacher or Tuesday Group members Rodney Frelinghuysen or Patrick Meehan leave their seats behind, as all three represent swing districts. And Duncan Hunter and Chris Collins may leave not only because of their committee term limits and moderate credentials, respectively, but also because they are both currently enshrouded by ethical clouds. Since 1976, the U.S. House has averaged 22 pure retirements per election cycle; at 13 Republicans and four Democrats, we’re still short of that total for 2018. Look for several of these Republican names to come off the board in the months leading up to 2018’s filing deadlines. CORRECTION (Nov. 28, 2017, 4:10 p.m.): A previous version of this article incorrectly included Rep. Paul Cook in the second table, which lists GOP House members who might retire. In fact, Cook has already announced that he will seek re-election in 2018. The table has been updated. We included lawmakers who have resigned, or are planning to resign, in the “pure retirement” category on a case-by-case basis. We included Pat Tiberi, who is resigning to lead the Ohio Business Roundtable, since we judged that to be like retiring from Congress to join the private sector. We included Jim Bridenstine among those leaving the House, but not as a pure retirement; Bridenstine initially pledged to simply retire in 2018, but he has since been nominated to be President Trump’s NASA administrator, which we judged to be akin to seeking higher office. We did not include Tim Murphy among the 24 departing Republicans because he resigned from Congress under pressure due to an extramarital affair — we figured that he did not leave voluntarily and thus did not fit the spirit of this analysis. Finally, we did not count Mike Pompeo, Ryan Zinke, Mick Mulvaney, Tom Price, or Jason Chaffetz because their replacements have already been sworn in. The statements from Frank LoBiondo, Charlie Dent and Dave Reichert. Ileana Ros-Lehtinen said Trump and the lack of civility in politics have “not been part of the calculation of retiring”; Lamar Smith claimed it “had no impact on my decision whatsoever”; Jeb Hensarling said it was “quite the opposite” and he was “rather enjoying” the current political climate. Specifically, the 2016 results are weighted 75 percent and the 2012 results are weighted 25 percent. The median Trump score among all House Republicans is 94.3 percent. An 89.9 percent rate of agreement may seem high, but by GOP standards, it’s downright rebellious. Ileana Ros-Lehtinen, Lynn Jenkins, Dave Trott, Frank LoBiondo, Pat Tiberi, Charlie Dent and Dave Reichert. Because the group doesn’t make its membership list public, it’s possible that some of the other retirees are also members of the Tuesday Group. We can make some good guesses, however, about who’s in the group based on public records and some members’ willingness to speak publicly about their participation. Ileana Ros-Lehtinen, Frank LoBiondo, Ted Poe, Sam Johnson, Jeb Hensarling, Lamar Smith and Bob Goodlatte.